What are the benefits of her unique book? 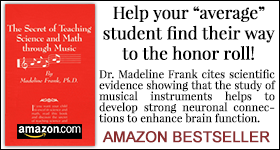 Dr. Frank has taken an average math student and put them on the mathematics honor roll! 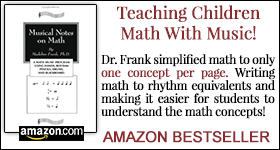 Dr. Frank has developed her unique, one of a kind, math to rhythm program for children! We’re honoring Top Teachers, Lifetime Achievement Awards for teachers, Top Graduating High School Seniors and Top University Graduates. The Nobel Prize never honored teachers so we are doing this. In a sense this is our Nobel Prize for hard working teachers and hard working students. 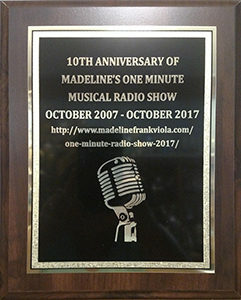 Madeline Frank received her Bachelor of Music and Master of Music from the Juilliard School in New York City as a scholarship student of William Lincer, former principal violist of the N.Y. Philharmonic and the Cleveland Orchestra. 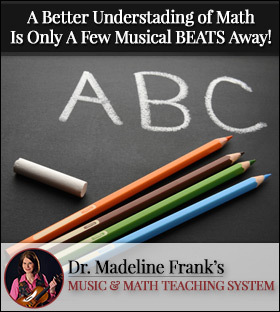 While attending the Juilliard School, she studied symphonic conducting with Maestro Vincent La Selva, Principal Conductor of New York Grand Opera Company, New York City Opera, the Opera Company of Boston and many international orchestras. Read More! 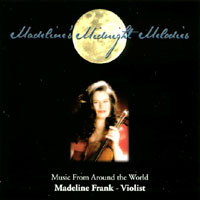 Madeline Frank, an international violist, has performed concerts throughout the United States, Europe, Asia, South America, Australia and New Zealand to critical acclaim. She has performed at the prestigious Purcell Room at the Royal Festival Hall in London and recently performed the “premier” of the Walton Viola Concerto with the Xiamen Philharmonic Orchestra in Xiamen, China. She was the “first American”, “first woman” and the” first violist” to perform in Xiamen, China. Read More! Dr. Madeline Frank profiles historical and contemporary icons that made music a part of their everyday life. Learn how music impacted their learning and helped shape the people that became. Live interviews and compelling insights await! Listen Now!